The Model MX-250 batch sand mixer was designed to fill the need for a machine that can go anywhere in the foundry. 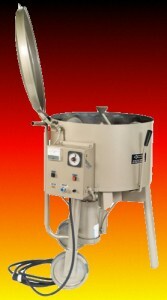 Its 200 to 275 pound capacity makes the Model 250 the right Mixer for small and large foundries, for industry, and for educational institutions. The Swif-Mix MX-250 moves the convenience of portability right into your foundry operation, yet is able to deliver the same efficient, heavy-duty service you expect from a stationary mixer. Portability and profits can move hand-in-hand. The increased convenience of wheeling the mixer from job site to job site can mean the difference between profitable jobs and losers. And there can be more numbers in the profit column because the efficiency of a full-scale operation does not have to be sacrificed for profitability. It also has heavy-duty engineering. This means performance you can count on and the increased efficiency and profits which go along with dependability. Sealed, anti-friction ball or roller bearings throughout. Abrasion resistant steel plows, faced at wear points with a smooth layer of tungsten carbide which is applied by oxy-acetylene torch. Abrasion resistant, hardened steel crib and base liners for extra life. Nine gauge thickness is standard. Retractable handles for added maneuverability. Convenient chute height means convenient unloading – wheelbarrow can be rolled directly underneath. Rolls to the job on 7.75 x 14 inch industrial type pneumatic tires. Shipped fully assembled and ready to go to work. Swif-Mix offers two sizes, MX100 MX250, each designed for efficient operation at a particular batch size; as well as greater economy, greater durability, lower maintenance and minimum downtime. Moreover, the low initial investment, coupled with the long life of the machine, makes the Swif-Mix Mixer the machine to choose for the greater return of investment. Bottom discharge door, easy one hand operation. Fully adjustable, carbide-edged, abrasion resistant steel plows. Hinged safety-dust cover with micro-switch safety interlock. Center binder addition with dispersal tube. Replaceable mixer crib. Liner made of abrasion resistant steel plate. 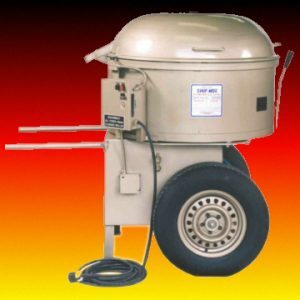 MX100 mixer – 100 to 125 pound capacity. Ideal for mixing single bag cold-set or no-bake core sand. 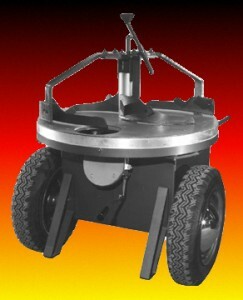 Ideal for vocational or technical schools and smaller foundry applications. Model MX-100 the right machine for preparing and maintaining floor sand in many vocational and technical schools, as well as in small foundry operations. Like other sand handling equipment, sand mixing machinery is usually considered self-destructive. Swif-Mix solves this maintenance problem while delivering completely mixed sand. Those mixer components subject to excessive wear can be easily replaced during routine maintenance. Because of this innovative concept, downtime is reduced to a minimum and high output is maintained for a greater return on the dollars invested. All of this is packaged in a mixer that is simple in design, ruggedly built, economically priced, and that delivers high efficiency performance. To insure thorough mixing, sand plows aerate and continuously churn the entire batch, blending the catalyst and binder uniformly throughout the sand. In any machine, bearing wear and maintenance are directly related to the weight of its moving parts. Swif-Mix has engineered in durability by reducing weight. Multiple-lip sand seals located inside the vertical drive shaft housing also prevent sand from entering and damaging bearings. Abrasion resistant steel plows are standard on all models. In addition, plows are hard surfaced along the leading edge with a tungsten carbide layer applied by the oxyacetylene process. Both inner and outer sand plows are fully adjustable and designed to give maximum mixing action. Simply pull one lock pin and the plow assembly can be lifted off the drive shaft. Any sand on the plow assembly can then be removed by tapping it on the floor or brushing with a whisk broom. Opening the bottom discharge door is an easy one-hand operation. The plow action makes discharge automatic and makes the mixer practically self-cleaning. Discharge requires about ten seconds. During the mixing cycle, a flat rubber seal seal prevents leakage, and a simple cam lock “locks” the door. The door is adjustable to compensate for normal wear. Plows – Abrasion resistant steel, hard faced with tungsten carbide. 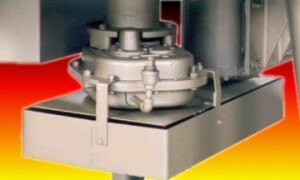 Base Plate – Replaceable abrasion resistant sectional plate. Crib Liner- 12 inch wide abrasion resistant plate, 9 gauge standard. Drive – Gear reduction, oil tight gear case, double V-belt drive. Bearings – Sealed ball bearings throughout. Motor – 5 HP, 1750 RPM, ball bearing, totally enclosed, fan cooled with overload protection. Specify voltage and phase when ordering. Electrical System – (Conforms to regulations for portable units) NEMA-1 dust tight outside control enclosure, with starter overload protection, start/stop station, fuses for control circuit. 25 ft. of heavy-duty 600 volt 4 conductor cable with 1 male locking-type NEMA L19-20 electrical plug. 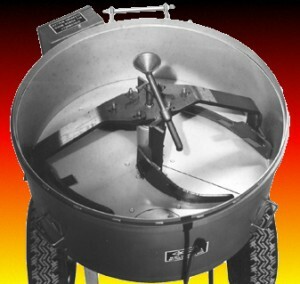 Cover – Heavy spun steel with lid interlock safety switch. Hood OPEN/Power OFF. Wheels – 7.5 x 14 inch (19.0 x 35.5 cm) industrial pneumatic wheels on ball bearing automotive spindles. Shipping Weight – Approx. 1225 lbs. Base Plate – Replaceable one piece plate. Crib Liner – Reversible 13 inch (32.5 cm) wide abrasion resistant plate. Nine gauge standard and available as a replacement part. Motor – 2 HP, 1750 RPM, ball bearing, totally enclosed, fan cooled with overload protection. Specify voltage and phase when ordering. Electrical System – (Conforms to regulations for portable units) NEMA-1 dust tight outside control enclosure, with starter overload protection, start/stop station, fuses for control circuit. 25 ft. (7.62 M) of heavy-duty 600 volt 4 conductor cable with 1 male locking-type NEMA L19-20 electrical plug. Shipping weight – Approx. 550 lbs. The Safety Lid Interlock Switch is standard on all models. 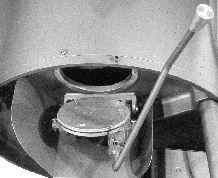 The switch assures that the muller or mixer lid must be closed for the machine to operate A micro-switch, activated by the lid, is wired in series with the holding circuit of the magnetic contactor. Short circuit protection is provided for the control circuit and over-current protection is provided for all motors, as specified in the National Electric Code. Most electrical components are UL listed or recognized. The standard and replacement base wear plate for the MX-100 is 9 gauge plate. The MX-250 comes standard with a 1/4″ abrasion resistant 3 piece plate..
A nine gauge abrasion resistant steel crib liner is standard on all models of mullers and mixers. Magnetic contactor with overload protection and start/stop station. Adjustable 0 to 10 minute timer with control transformer. Ampmeter to control machine loading. Safety lid interlock and discharge control button. Controls which are mounted in a dust tight NEMA 1 control enclosure. All electrical wiring conforms to the National Electric Code. A speed reducer is used in the drive train of the Model 250 muller and Model MX 250 mixer. This produces higher loading capacity and horsepower ratings. The reducer is a Standard Heavy Duty Component produced by a major manufacturer, and is a shelf item. Motor ratings for all models are oversized to a higher horsepower for better efficiency and longer life. Each motor is a totally enclosed, fan cooled, ball bearing design. Motors can be furnished in either single or poly phase, dual voltage. All motors are UL and CSA listed.